Nov 5, 2017 Posted by AAfterwit on Nov 5, 2017 | Comments Off on Another Sign That The Media Is On Top Of Stories And Facts. Another Sign That The Media Is On Top Of Stories And Facts. 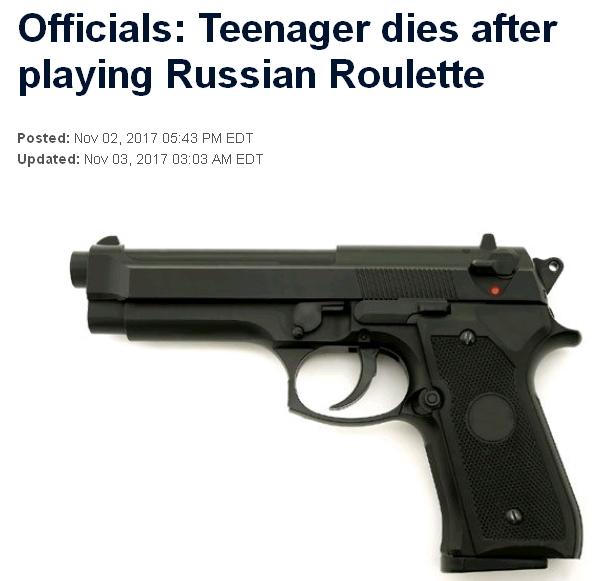 From our friends over at This Ain’t Hell (But You Can See It From Here) comes the tragic story of a teenager who shot and killed himself while playing Russian roulette. COLUMBUS, Miss. (AP) – Authorities say a Mississippi teenager who shot himself while playing Russian Roulette has died. Lowndes County Coroner Greg Merchant told news media that 17-year-old Tovaris Deloach died Wednesday afternoon at Baptist Memorial Hospital-Golden Triangle. Officers found Deloach in a bedroom with an apparent gunshot wound to the head Tuesday. I don’t recommend using a semi-automatic handgun for your game of Russian Roulette. This is not to say that the teen’s death is not tragic, but doesn’t the WCTI Channel 12 understand the difference between a revolver and the pictured semi-automatic weapons? Columbus police spokesman Joe Dillion says three other males in the room told officers Deloach was discussing Russian Roulette as he took out a revolver and removed the bullets. WCTI Channel 12 is out of New Bern, North Carolina. “Getting The Facts Right” is more than a slogan at WCTI-TV NewsChannel 12. It’s a commitment we make to you everyday, in every newscast. That’s what sets us apart from other news stations. Before we report the news, we check the facts. Then, we check them again to make sure we get the facts right. We do this to earn your trust with every single story we write for you. They check facts not once, but twice!